A day of research in our laboratories costs on average £2,740, or almost £1million a year. We rely on the generosity of individuals, businesses, clubs, and our partner charity Brain Tumour Research to keep this essential research going. This helps us to purchase vital equipment and materials and to fund our growing team of researchers which has grown from three to 20 since 2014. Your support could help us make those important discoveries to help patients and their families. We invite you to meet our research team, below. Professor Hanemann leads our world-leading research into low-grade brain tumours. His aim is to identify and understand the mechanism underlying the development of brain tumours, and explore ways to halt or reverse that mechanism using a 'bench-to-bedside' approach. "At present the only treatment options are chemotherapy or invasive surgery. By testing drugs in a such a fast track way, we achieve the potential for making drug therapies available to patients faster," said Professor Hanemann. Meet the rest of Professor Hanemann's team below. Professor David Parkinson was drawn to Plymouth through the opportunity to work with other great scientists in an environment with the right equipment. "One of the unique approaches we have in Plymouth is to study the human tumour cells directly. This means we can test new approaches and therapies quickly," he said. Professor Parkinson actively interacts with those affected by the disease, some of whom help to fundraise towards the research in the laboratories. "It has been very humbling to meet individuals and families that have been directly affected. This really underlines the importance of the work we are doing. I greatly appreciate the hard work you are doing to raise money in the fight against brain tumours. We will do our very best to translate that into better treatments for the future." Professor David Parkinson. In bringing her research to the University of Plymouth, Dr Claudia Barros was able to establish her own laboratory team to focus on neuroscience and brain tumour research. “Our brain remains to date one of the most unknown subjects of research. Our curiosity and the will to contribute to the knowledge of how our brain functions in health and disease drives colleagues and me daily,” she said. Daniele Baiz is a Marie Cure Research Fellow working in Professor Hanemann’s lab. He is currently working on early diagnosis techniques to detect a brain tumour before symptoms even present. “Plymouth is growing as a research centre for the South West. 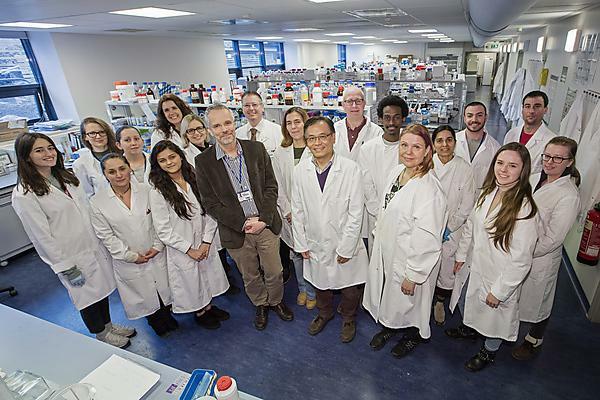 I decided to bring my knowledge and expertise to Plymouth because I believe that they will be useful to serve the fight against brain tumours,” he said. “The most rewarding aspect for me is interacting with people involved in supporting brain tumour research. Our supporters play such a crucial role and their energy is a strong motivation for us scientists." Foram was looking for an opportunity to grow her research skills when she found the position in the Plymouth Centre of Excellence. "I desperately wanted to be a part of this team and give my best to the research for human kind." she said. "The most rewarding aspect is being a part of the highly dedicated and talented research team, whose main aim is to improve the lives of people and their relatives. Jemma enjoys the close relationships within the research team and with Plymouth Hospitals NHS Trust, which help to speed up the research. "It is a team effort, we support each other in overcoming problems to move forward. This inspires us to keep pursuing our research and make those important discoveries," said Jemma. Our collaboration with Derriford hospital provides human tumour samples for our researchers to work with. "Working with patient samples is important when checking the effect of potential therapeutic drugs and enables our bench to bedside approach to produce efficient and reliable outcomes for patients." "We are extremely grateful and thankful for the continued support of the charity, donors or fundraisers. We would not be able to undertake this research without them." Liyam was drawn to Plymouth through a PhD opportunity in his field of interest in cancer research. "Plymouth's approach is great. It allows us to work alongside Clinicians, resulting in quicker, more meaningful research," he said. The continuation of the research is dependant on charitable giving. "We are really grateful to all the fundraisers, your support keeps us motivated to work hard every day in order to make a real difference." If you chose to help us in the 'last battle ground against cancer' then your efforts will be commemorated with a tile on our Wall of Hope when you raise £2,740. We will invite you onto a lab tour to meet the team and see the work they do, followed by the presentation of your tile for you to place on the wall. The Devon Junior and Minor Football League recently placed their tile. We would love to see you at a lab tour to place your tile; so please tick the box on our donation page which allows us to contact you when you donate. You can also contact us on +44 (0)1752 588045.